Since their rediscovery in the 16th century, Rome’s catacombs have dazzled the archaeological community. The ancient underground burial networks are a famed burial site both for Christians and for people who worshiped any of the earlier Roman religions. Underneath the city, people were either placed in distinct catacombs or buried together. It began as early as the 2nd century AD, when inhumation had become a more common funerary practice. Christians at the time typically opted for burials instead cremations, as they believed in bodily resurrection at the Second Coming. As an extremely important site, Rome’s ancient catacombs represent an epic monument of the ancient empire and the inception of Christianity. Moreover, the catacombs also provide an invaluable contribution to the history of early Christian art. They have been a treasured site with a plethora of frescoes, sculptures, or gold-glass medallions among other items, which widely exemplify the artwork done before 400 AD. 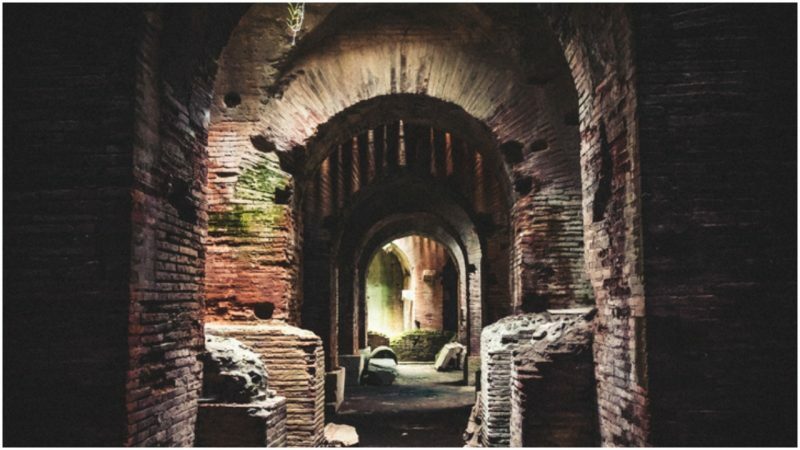 The exploration and excavation of Rome’s hidden tunnels seem to be a continual work in progress. The discoveries have never ceased to surprise us. Not only have new chambers been identified in recent decades, but so have new precious artifacts. In May 2017, restorers put the finishing touches on a seven-year restoration work of two underground burial rooms in the Catacombs of Domitilla. Thanks to their effort, two long-hidden frescoes, which were likely commissioned approximately 1,600 years ago by bakers in the city, have been revealed. 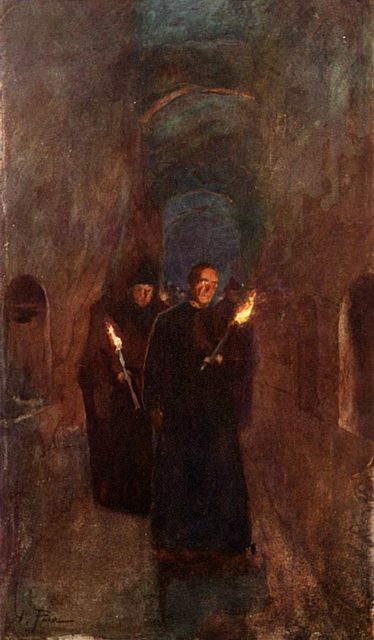 A procession in the Catacomb of Callixtus, painting by Alberto Pisa. The Catacombs of Domitilla, named after Saint Domitilla, expand over 11 miles of underground caves. As large and impressive as they are, they are exceptional for several other reasons. 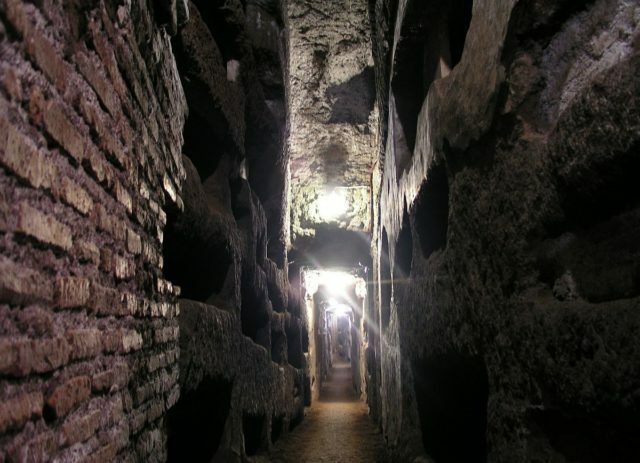 They are the oldest of Rome’s catacombs, and the only ones still containing bones. Reportedly, they alone have been the burial site of almost 150,000 bodies. The Domitilla Catacombs are also the best-preserved and the most extensive of all ancient burial networks beneath the city. Among their treasures and invaluable artifacts is a 2nd-century fresco of the Last Supper. Lurking under a chalky deposit and algae domesticated after centuries of being abandoned, new frescoes have been found. Experts have used lasers and scanning technology to restore the paintings, stripping away the deposits, layer by layer. The technique used has never before been applied in catacombs. As the layers have been removed, numerous images have slowly started to emerge on the surface, depicting figures from the Old and New Testament, and also vignettes related to the baker’s trade. One of the scenes revealed in the frescoes depicts the deceased accompanied by two saints. The saints may be Nereus and Achilleus, who were two martyrs, most likely killed under Emperor Diocletian and buried here. According to the experts, all evidence shows the frescoes’ origin dates back to the second half of the fourth century when a similar type of iconography was common. Restoration projects at the catacombs are set to continue further, as there are still more chambers that are in poor condition. It might mean that new finds just may be on their way. A new museum, to be inaugurated in June, is to showcase artifacts dating from the 2nd to the 5th century from several catacombs in Rome. The collection is certain to shed light on how paganism and Christian faith were mysteriously intertwined together in the early Church.